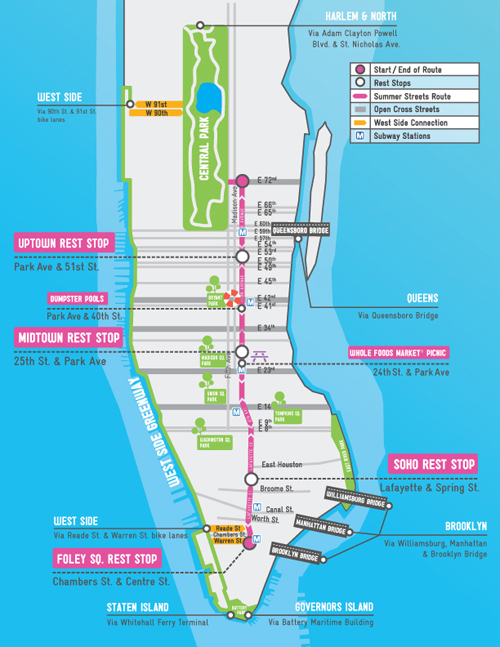 NYC DOT and our partners are proud to present Summer Streets. This summer, for the third year in a row, we will temporarily close Park Avenue and connecting streets from the Brooklyn Bridge to Central Park to motor vehicles and open it up to people on three consecutive Saturdays in August (August 7, 14, & 21). DOT also partners with groups citywide to bring some summer streets fun to neighborhoods in all five boroughs. Visit the Weekend Walks website to find one near you. Join NYRR for a 4.5-mile "fun run" on Saturday August 7 to kick off the 2010 DOT Summer Streets program. Pre-registration is required by 11:59 pm on Friday August 6 and limited to 500 people. 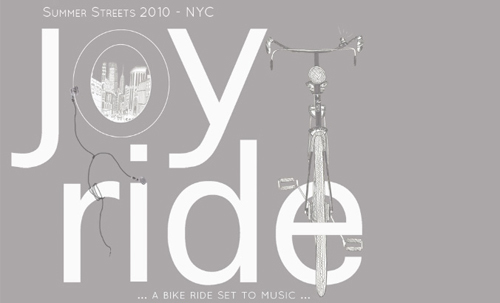 Joy Ride is a a group bike ride set to music. All the world’s a stage and you are on a bike to watch it. Motion, music and mingling will transform the way you see the city. Its as easy as...well, it’s as easy as riding a bike. Joyride is a musical group bike ride and picnic created by theatre artist, Liz Sherman with a soundtrack designed by Grammy-award nominee Duncan Bridgeman. At it’s heart Joyride is about the freedom we feel riding a bike, the deep ways that music affects us and the power of that shared experience. Joyride takes place on August 7th, 14th, & 21st. The ride begins each of the three Saturdays at 11:00 am at Foley Square, follows the Summer Streets route and ends with a picnic in Central Park. Participants must ride with speakers or use only one ear bud as required by law. Space is limited so sign up today at www.joyrideo.com. Summer Streets lets you re-imagine the way we use our City streets. MacroSea has done the same for the humble dumpster. They have taken clean, unused shipping containers and transformed them into code-compliant swimming pools, complete with their own life guards and pool decks! The pools were an underground sensation in Brooklyn last year. 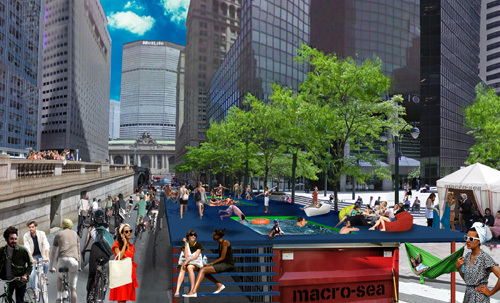 MacroSea is now excited to share them with all New Yorkers as part of Summer Streets. The pools will be set up near the Grand Central viaduct and free entry bracelets will be handed out for time slots on a first come, first served basis. The New York International Fringe Festival will bring FringeJR and FringeNYTEASERS to the Soho rest area all three Saturdays. FringeJR will feature family-friendly theater shorts as well as interactive theater-based activities for kids. FringeNYTEASERS are like movie trailers -- but for plays. Enjoy samples of the plays being presented as part of the theater festival by over 200 theater companies from New York City and around the world.